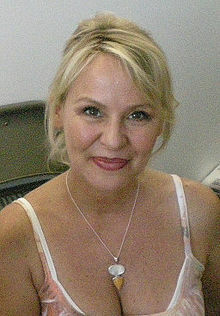 Wendee Lee (born February 20, 1960 in Los Angeles, California) is an American voice actress. She is best known for voicing, or speaking, in many different video games, Power Rangers episodes, and dubbing, or film making, in anime. She is also a vegetarian. ↑ "Most Prolific Cast". Anime News Network. Retrieved July 2, 2008. This page was last changed on 17 February 2019, at 18:43.